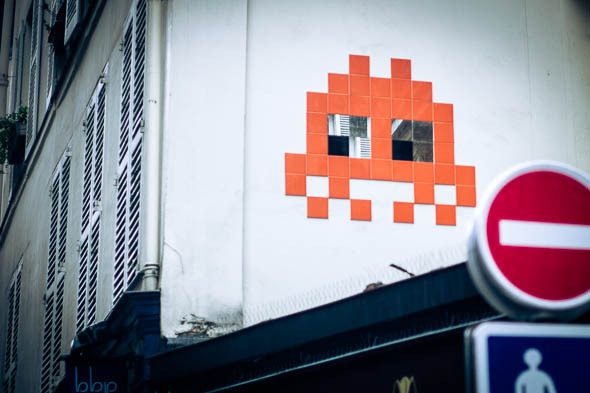 Who hasn’t seen those little Pacman-ish graphics in Paris? 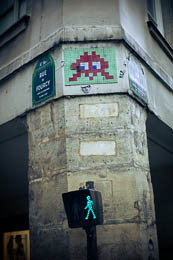 Made by the French urban artist ‘Invader‘. Always wondered how and when the project was executed and the graphics were applied? Here a film about the Invader at work in Paris, the city where Invader started his project. Found on Wooster. It may be (?) an old film but like to share it anyway. The Invader photos I made in Paris in October 2011. 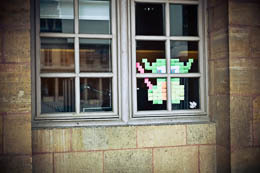 Nice Post-It take on the Invader concept below on the right.. This entry was posted on Sunday, January 13th, 2013 at 3:09 pm. It is filed under All posts, Miscellaneous and tagged with graffiti, movie, Paris, street art. You can follow any responses to this entry through the RSS 2.0 feed.